Just like regular Spinner batteries the Rainbow features variable voltage output with 510 and eGo threading to suit most atomisers. The difference is in the finish - it's like a rainbow! Seriously though, these things look really good. 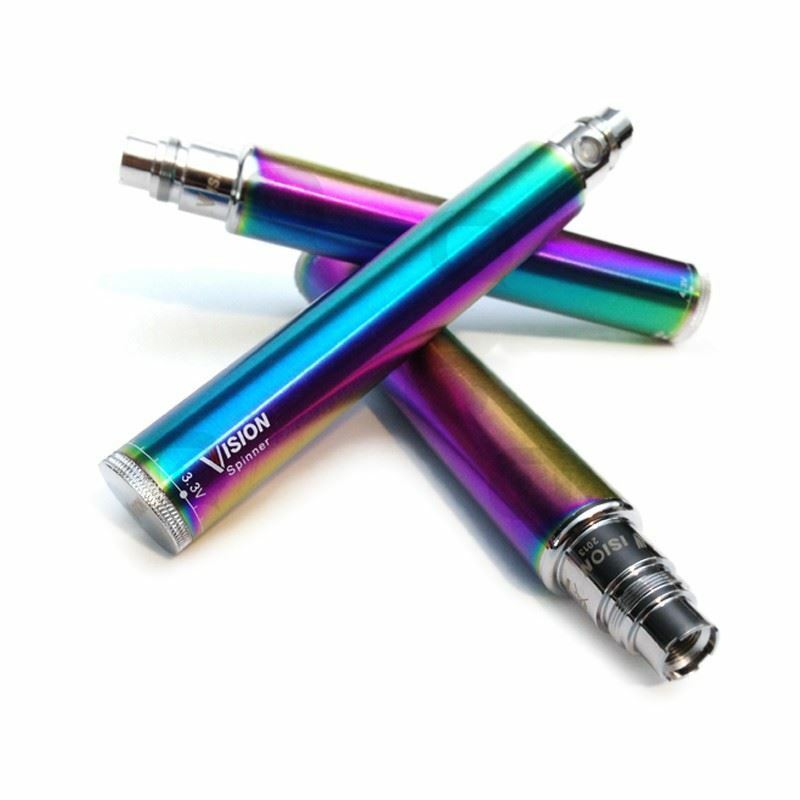 The new Vision Rainbow Spinner batteries offer variable voltage in an eGo sized format. Spin the bottom dial and tailor the vape to just the way you like it. From the compact 400mAh to the long lasting 1100mAh there is a Rainbow Spinner for you. 5-Click protection: Generally, the battery is shipped in the off position. In off position, it will not function even when pressing the button. To turn on battery, press the button 5 times within 2 seconds. You will see the white LED flash. To turn off battery, again press the button 5 times within 2 second - the white LED will flash. "5-click protection" can protect the battery from being activated when not in use. No more firing in your pocket! Cut off time: If the button is pressed for more than 10 seconds, the battery will shut off until the button is released. Short Circuit Protection: When a short is detected, the battery will shut down until the short is removed. How to adjust the output voltage? There are 16 grids on the knob at the bottom, and each represents 0.1. Spin the knob in a clockwise direction to increase output voltage and spin the knob in anti-clockwise direction to decrease output voltage. Higher voltage produces a warmer vape with more vapour.